Jatindra Engineering Corporation is a well known for turnkey installation of Tube Mills & Auxiliary equipments. We offer durable yet cost effective solutions for high speed quality production of tubing of divergent size, metal or alloy. A complete range of other auxiliaries i.e. 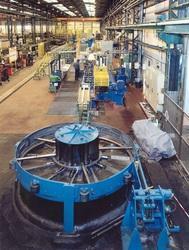 Tube Straightening Machines, End-facing Machines and Hydro-testing equipment etc. is also available. We have on offer various largely sophisticated outputs of tube mills that see utility in many segments, roof panels, fenders, crash guards and channels. We ensure an excellent client feedback program on our systems. Such programs have helped us in developing a better understanding of the markets needs and requirements. Execution of projects according to the needs of the clients.